Condo sales in Telluride and Mountain Village have risen by $5.2 million in October of this year, a 24% increase compared to October 2016. 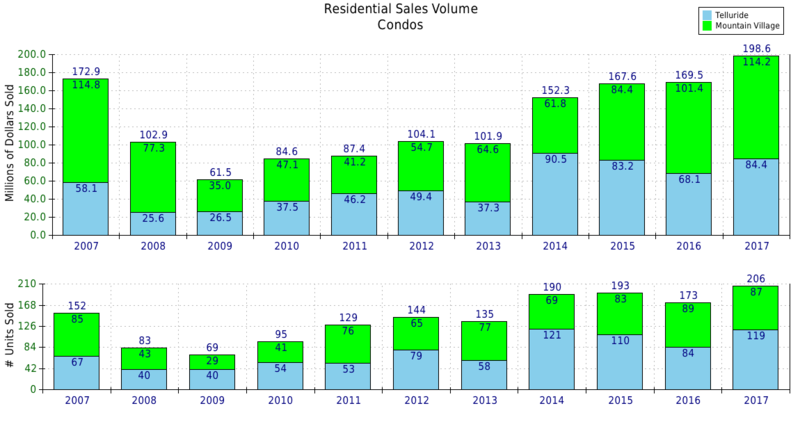 Condos sold in October ranged in price from $155,000 to $2,990,000 with a median sold price of $890,000. The least expensive condo sold consisted of 273 square feet, with 1 bedrooms and 1 bathrooms and was built in 1977. It was on the market for 0 days before being sold. The most expensive is a condo built in 2013, had 4 bedrooms, 5 bathrooms comprising 3,948 square feet and it was on the market for 121 days.